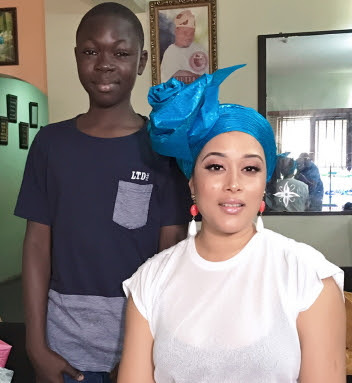 Nollywood actress, Adunni Adewale, popularly known as Adunni Ade, recently shared photos of a 13-years-old boy named Fatai Azeez who is a make-up artist. Fatai Azeez is in junior secondary school (JSS)3 and he is doing a good job tying gele. Adunni Ade was impressed with the way he tied her gele for an event and couldn’t but share the amazing job the young boy did. Now the little boy has being featured on BBC news telling his short story. Adunni Ade who was obviously elated took to Instagram to write more about him. Though he had an idea but wasn’t totally getting it and we ended up with the “Fan” style. A week later after being contacted by BBC for an interview, he was gonna have to tie my gele again on camera. Y’all guess what he tied? Yep! The same “Rose” I initially requested. All I did was Smile. Why did I smile? This young kid paid attention to my earlier request! Learnt it and tied it for me. I sure don’t have no powers! All glory to God ! You know the saying, when it’s your time, it’s your time. I promised him if he tied my gele, I’d post a picture to gain him few customers as my lil way of supporting his talent. @bbcafrica @bbcnewspidgin thank you for reaching out! Thank you for taking interest in the well being of children. The few people I met there are absolutely amazing! Super kind, level of professionalism is outta this World. A child should be able to live to his / her fullest potential. God bless OUR Children all over the World. Amen!